The coastal configurations of the island are quite impressive. There are many beautiful and windless bays as are: Hohlia, St. George, Poro and Maistro as well as their small promontories. The bay of St. George pro­vides a safe harbour for ships because it protects them from the northerly winds therefore it is here that the ships of the line make anchor. Alternately the closed bay of Katholikos protects fishing vessels from the southerly winds. The surface of this islet is comprised of rocky and bar­ren hills. Areas appropriate for agriculture are very few indeed. The vegetation cover is poor and bushy and consists of sage plants, oregano, thyme, lentisk, cheno-pod, and bush-like wild olives. The tree cover is sparse and varieties are mainly olive, carob, almond, fig and prickly pear. Fresh water springs do not exist except for a few wells with brackish water. Water for the inhabitants is col­lected by way of rain water cisterns which are filled by water carrying tankers in times of drought. A few ancient relics, which were found on the island, allow us to surmise that Yetousa was inhabited from ancient times. But from time to time it seems that it often remained unoccupied for long periods of time. This was especially so in times when piracy was prevalent in the Agean and these periods were common from ancient times even until the nineteenth century. Settlers from Patmos and Fourni probably finally inhab­ited the island permanently in the middle of the 19th century. There is witness of there having being estab­lished on the island, some five or six families in the year 1985. Today the population of the island is 112 people. After the incorporation of the Dodecanese to the rest of Greece, the island falls under the jurisdiction of the municipality of Patmos of the province Kalymnos, with the name of Agkathonisi or Gadaros-'Donkey' (because the shape of the island resembles a donkey galloping towards the river Maiandros). In 1953 it became a separate community and remains so until today. Several community governorships have tried from time to time to improve the standard of living for the inhab­itants of the island with various works for infrastructure. Roads were constructed (both rural and community roads), in 1984 electricity was connected by the Public Electricity Service, in 1985 a jetty was constructed in the harbour of St. George and in 1992 construction of a heliport was completed. The oldest settlement is Megalo Chorio or "Big Village" with 80 inhabitants. This village has been built in such a way so that it is not visible from the sea, thus protect­ing it from pirates. Built in the same way and for the same reason is Mikro Chorio-'Small Village' with 15 inhabitants. The third and newest settlement is St. George with 15 inhabitants and is found in the inner­most part of the bay from which its name is derived. Both the bay and the village were named after the church of St. George found there, which also happens to be the parish church of the island. There are also five chapels built in various places on the island. The economy is depended on animal farming, fishing and tourism. Animal farming is conducted 'free range' and therefore produce is small in quantity but of excep­tional quality. There are some ten professional fisher­men earning a living from the waters surrounding the island although in recent years fish farming has been a successful addition. 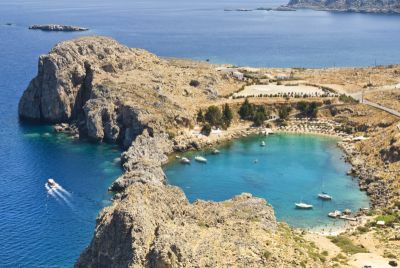 As has occurred with the other Dodecanese islands, visitors to the island have steadily increased making tourism a main source of income for the economic development of the island. If you enjoy a relaxing period without the touristic stress factors (discos, noisy traffic) this is the place! Eating at the "Seagull" and swimming in the sea 10 meters away (30ft) before retiring to Maria's hostel also 10 meters away is just heaven. Why not get an impression at http://agatonisi.router.nu - the webpage I made out of love for Greece?